Looking through the 2008 Season Statistics for Our Washington Nationals--the following "Did You Know Facts" stood out for me. Less obvious notes that you might not otherwise catch. The African Queen was getting a kick out of hearing some of these while learning more about Our Team. After finishing 2008 with a 59-102 record, Washington has recorded a 284-363 (.439) record since the Inaugural Season of 2005. The Franchise's 24th losing season in their 40th year of Major League Baseball. Last May 19th, when Washington defeated The Philadelphia Phillies on South Capitol Street, The Franchise recorded it's 3000 Career Victory. The first 2,755 coming as The Montreal Expos. Washington did have a winning 5-2 record when drawing greater than 35,000 at Nationals Park. And were 16-18 when the crowds at home reached 30,000 or more. But they were winless on Artificial Turf (0-3), 59-99 on grass, and were shutout 20 times. Washington had 32 Wins and 49 Losses at the halfway point to the season. 27 & 53 the rest of the way. August was the closest Washington came to playing .500 ball for any particular month: 14-15. Wearing Home Whites--Our Washington Nationals were 26-33. Wearing "DC" Red: 8-13. The Atlanta Braves were soundly beaten in the season series against Washington--Braves losing 12 of the 18 games played. The Florida Marlins on the other hand--pounded Washington to a tune of 14 Wins and just 3 Loses. Washington used 50 different players, 25 of whom were pitchers. 15 Rookies donned a Nationals Uniform in 2008. Only Shawn Hill and Nick Johnson are the remaining players that wore Montreal Uniforms before the team moved to DC. By finishing with the worst record in Major League Baseball, Washington will be given The Number One Overall Pick in the 2009 Entry Draft. The Franchise has never drafted first before in 40 years. The Expansion Washington Senators picked first in 1969 and chose Jeff Burroughs--who eventually became an American League MVP and Two-Time All-Star. Ryan Zimmerman is the only current National to have started at least three straight Opening Days for Washington (2006-2008). Cristian Guzman was the only Opening Night Starter to not go on the DL in 2008. Every position on the field was affected, except shortstop. "The Guz" and Willie Harris were the only players that were on the roster all season that DID NOT visit The DL. (Everday Players that were available for all 162 Games). Emilio Bonifacio and Roger Bernadina both wore two different uniform numbers last year. Bonifacio first 6, then 7; Bernadina first 7, then 2 (after FLop was released). Rob Macowiak and Alberto Gonzalez both wore number 12 in 2008. Ray King and Charlie Manning both wore number 36. Guzman had 57 Multi-Hit Games; Milledge 35; Harris 26; Zimmerman 23 (despite missing 50 games to injury). Jesus Flores led the team with 18 Multi-RBI Games; Milledge was next with 14 and Ronnie Belliard had 13; Zimmerman 12. Washington had 59 Game Winning Hits total--Jesus Flores, Elijah Dukes, Ryan Zimmerman and Lastings Milledge provided 26 of those--and Willie Harris provided five more. So 5 different players provided more than 50% of Washington's 2008 Game Winning Hits. Dukes also led the team in Outfield Assists (9), far outdistancing the second most by Harris with four. Remember, Dukes missed nearly half the season to injury. The Last Home Run hit by Our Washington Nationals during the Inaugural Season at Nationals Park was stroked by Ryan Zimmerman. Ironically, off Scott Olsen, then of The Marlins--now a teammate on 9/23/08. The Last Home Run given up by Our Washington Nationals during the Inaugural Season at Nationals Park was given up by Levale Speigner. And just as ironically, Josh Willingham, then of The Marlins, now a National--hit that one on 9/24/08. Chris Curran (OF), Esmailyn Gonzalez (SS--GCL Batting Champion)--Rookie Gulf Coast League. Just some interesting facts about Our 2008 Washington Nationals worth passing along. Study Notes for The African Queen as her Graduate Work in Baseball continues. You may recall some of the talk about a Water Taxi Service to Nationals Park. From the very first days of the South Capitol Street location being named as the stadium sight--some fans, some businesses and even some front office staff for Our Washington Nationals have all mentioned the possibility. With Year Two of Nationals Park close at hand--we went looking for an update. And found out there has been little movement on making a water taxi service to the ballpark a possibility. The District Of Columbia Government has yet to move on even a single proposal for a dock adjacent to the ballpark. In fact, there have been no proposals. With the economy in such a downturn--Ballpark District Development has slowed a bit. Which also means Florida Rock--the cement company located on Potomac Avenue SE--may not be in a hurry to vacate their business property, as planned, to lead the re-development of the Anacostia Waterfront. And if the Anacostia Waterfront project is put off until the economy rebounds--you can bet Florida Rock is not going to want to sit on newly vacant property when their cement business can still churn over dollars for their coffers. That would not be sound business. As for the potential Water Taxi operators, Potomac Riverboat Company told us they would love to sell The African Queen, me or anyone else wanting a ticket to Nationals Park from Alexandria, Virginia on one of their boats. But only as soon as the pylons begin to be driven for a new dock next to Nationals Park. So it's probably safe to say: any Water Taxi to Nationals Park is not going to begin operations in 2009--either. According to a email sent to Season Ticket Holders late this afternoon--the new and improved Season Ticket Partner Zone is up and operating. Ticket holders can search for others to share their season tickets for 2009. A Free Service. Partial Season Plan Holders can now post their tickets for 2009. The Minimum amount of game tickets one must post has been lowered to 10 different games. And Lexus Presidents Club and PNC Diamond Seats can now be added to The Zone. 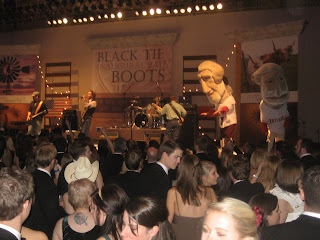 Considering the ongoing faltering economy--every little bit helps to enjoy Nationals Baseball in 2009. Yahoo! Travel lists Nationals Park as Number Two on its new Top 10 List of Sustainable Design. In fact, they call The South Capitol Street Ballpark a Must SEE for Eco-Tourists. Even going so far as to call The LEED-Certified Ballpark--ICONIC. How about that? Yahoo! Travel also really likes The Bike Valet option too! Number One on the list is The Living Roof of The Science Center in San Francisco. Very Interesting. The District Of Columbia Government and Our Washington Nationals--Game Changers In Green Technology--But Iconic? Never expected to hear that word to describe Nationals Park (as much as I enjoy it). This past Sunday night, a celebration was taking place at The Potomac Nationals 14th Annual Hot Stove Banquet and Silent Auction. The Mills Cup--The Carolina League Championship Trophy--was on display. And not lost on most of those in attendance at The Hyatt Fair Lakes in Fairfax, Virginia, was the very fact that The Potomac Nationals success of 2008 reflected well on the still growing Farm System of Our Washington Nationals. A barren system just a few short years ago that now--at least for the first time since The Franchise moved from Montreal--is on the verge of developing some impact players for The Major League Team on a more consistent level. On hand to meet and greet The P-Nats faithful at The Hot Stove was not only Washington Senator Great--Frank Howard, but also Bobby Williams--The Director of Player Development for Our Washington Nationals. Mr. Williams was there to update some of Potomac's most faithful fans--assuring them that even more young, quality talent is coming up through Washington's System. Some of whom will be playing in Woodbridge, Virginia this year for The P-Nats. After the program and presentations had all ended, Bobby Williams sat down with me for an engaging interview. He had 10 Minutes and we attempted to cover a lot of ground in a short period of time. That concluded My Conversation With Bobby Williams. Clearly, The Farm System for Our Washington Nationals still has some holes to fill. But, progress has been made since the 2006 Season. And for first time since that Inaugural Season of DC Baseball in 2005, there is a light to be seen at the end of what was a long dark and empty tunnel. Some talent has now been drafted and is currently being developed. Hopefully soon, some of that work will pay off and make a serious impact on The Major League Team called Our Washington Nationals. 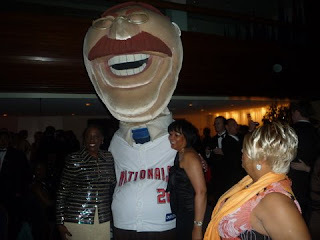 With all the activity surrounding The Winter Caravan, Season Ticket Holder Luncheon and NatsFest over the past six days, there was not a really good time to post up The Inauguration Photos Of Our Racing Presidents on the party circuit. 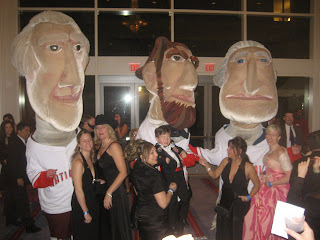 Not only did Abe strut down Pennsylvania Avenue on top of The Illinois Float for The 44th President Of The United States' Inauguration Parade, but he along with Tom, GW & of course Teddy, partied throughout The District of Columbia that evening of January 20th, 2009. 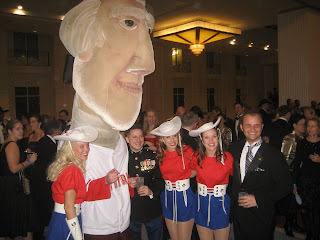 Here are a few of those photos showing The Rushmores strutting their stuff--courtesy of Our Washington Nationals. 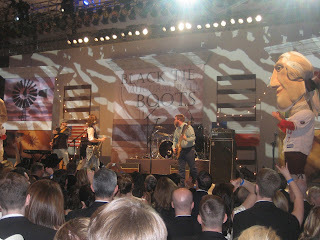 Abe, Tom & George at The Black Tie & Boots Inaugural Ball. 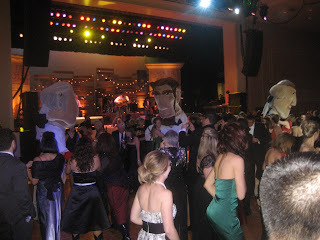 Always on a course of his own--Teddy flying solo at The Delaware & Arkansas Inaugural Balls. And now some Bonus Pictures--My Best Friend!! Screech!! in Syracuse with Teddy at The Chiefs Hot Stove Banquet on Friday, January 16th. Never shy for the camera--Our Lovable Loser--Teddy--always gets the big TV Interview. No matter where Our Racing Presidents go, they always draw a crowd. 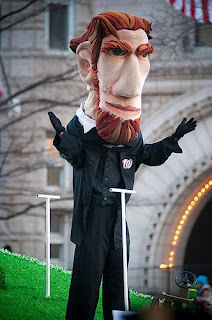 All Photos Courtesy of The Washington Nationals--All Rights Reserved. Tonight at 7PM Eastern, newly announced MASN Color Analyst for Our Washington Nationals was available via conference call for the local media. Given the opportunity to call in--I listened and transcribed the entire 16 minutes of the conversation. Before this Press Conference occurred, Our Washington Nationals released a brief statement by Team President Stan Kasten: "We are thrilled to have a talent like Rob Dibble join our broadcast crew. His enthusiasm and knowledge will quickly make him very popular among Nationals viewers. Rob and I talked today about the three things we know he will be: honest, informative and fun." MASN spokesperson--Todd Webster--mentioned to the media that Don Sutton was offered an opportunity to return to Atlanta and broadcast for The Braves again and had asked to be let out of his 4 year contract with MASN. Washington then set up a series of criteria given by Mr. Kasten and John Guagliano (Vice President of Marketing and Broadcasting for Washington) in finding Don's replacement--including someone who was committed to the team long term. MASN worked with the team to find the right candidate--all done privately. More than 10 were originally considered. Although complete contract terms were not disclosed, Rob Dibble received a contract for MORE than two years--that's as specific as it got. Question: One of the great things about your style is that you have been very candid and very passionate about your stances on a number of issues in regard to baseball. Do you feel now being part of a broadcast team is going to take away from that passion or will you be as outspoken as you have always been? Question: Why do you think that you and Bob Carpenter will be a good fit together? And also, you will be the 4th analyst on MASN TV for The Nationals—are you here to stay for a while? Question: You mention remaining on with Sirius/XM in some capacity. Can you describe what your role there will be? And secondly, since we don’t have a full resume for you, what is the extent of your game calling on television—color commentary and play-by-play? Question: And your Sirius/XM role going forward? Question: What impressions do you have about The Nationals at this point? What do you know about them, their roster, their talent, etc? Final Question: I was wondering whether you had any reservations about coming onboard here given the fact that The Nationals were fairly down in the TV Ratings last year. I think they were last in The Majors? That got a lot of attention. I was curious to know about the level of interest in baseball in Washington? With that final answer--no further questions were asked of Rob Dibble. I don't know much about Rob Dibble in the broadcast booth. Followed his career with The Cincinnati Reds when he was part of "The Nasty Boys" bullpen, but don't recall having seen him much On-Air broadcasting baseball. I've never watched the Fox sports program he co-hosts. So, I really have no judgement to base his work on. People tell me he is a 'tell it like it is" sort of analyst. And that Rob Dibble doesn't beat around the bush in giving his opinion. Whether that's good or bad, I will find out soon enough. For as of today, Rob Dibble was named to replace Hall Of Famer Don Sutton in the broadcast both for MASN Nationals Television Games. Being a former Cincinnati Player, Dibble really made me chuckle upon hearing his name--figuring JimBo might well have had a hand in his signing here. Meanwhile, Sohna and I will miss Don Sutton. We thought he provided an excellent level of baseball knowledge to each broadcast and was a really nice man too. Good Luck Don--to you and your family--back in Atlanta. 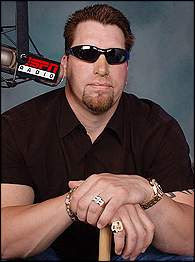 (WASHINGTON, D.C.) --- MASN has named Rob Dibble as the new color commentator for the Washington Nationals. He will join play-by-play man Bob Carpenter in the booth beginning with the 2009 season under a multi-year contract with MASN. A 2-time All Star and MVP of the 1990 NLCS with the Cincinnati Reds, Dibble was part of the "Nasty Boys" bullpen which helped Cincinnati win the 1990 World Series. His broadcasting career includes stints at ESPN, Fox, and FoxSports.com. "I'm excited to join MASN in covering one of the great new franchises in baseball, and I'm honored to be part of the MASN and Nationals' families. I will try to bring my experience as a pitcher, a ballplayer, and a broadcaster to the booth and bring fans a deeper understanding of what's happening on the field," said Dibble. "I've never been shy about sharing my opinion, so fans will know where I'm coming from." "MASN has earned a national reputation for its commitment to the Nationals and to bringing fans inside the game, with features like Wired Wednesdays and pitch tracking. I'm looking forward to being part of the biggest baseball network in the country." Dibble's arrival at Nationals Park will be a reunion in the broadcast booth, as he worked with Bob Carpenter at ESPN in the 1990s. The Nationals' former color analyst, Don Sutton, who was halfway through a 4 year deal with MASN, had asked to be released from his contract for personal reasons. 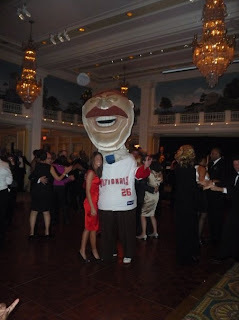 "I have truly enjoyed the two years I had in Washington covering the Nationals and working for MASN. I will always be thankful that my wife Mary, my daughter Jackie and I had this experience. MASN is a first-class operation and deserves great credit for their pioneering success at presenting the Nationals games and effectively promoting the team. I appreciate that MASN has granted my request to be released for personal reasons, and I'm grateful for their understanding and cooperation," Sutton said. "I'm going to miss the class, the professionalism and the friendship of the folks who made sure we got good pictures on the air." 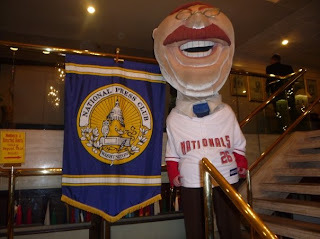 Dibble will make his high-energy debut in the MASN booth during Nationals spring training in March. UPDATE: The Potomac Nationals announced The 14th Hot Stove Banquet and Silent Auction raised $3100 for The Boys & Girls Clubs of Greater Washington. “There were people concerned when they (The Washington Nationals) first came in they would take fans away from us," stated Art Silber, Owner of The Potomac Nationals. "But it's really almost two different things. The cost factor (to attend any game) is a significant difference. And I really believe that more than anything, the closeness has built up even more fans for us because a lot of the Major League Fans never came to Minor League games. 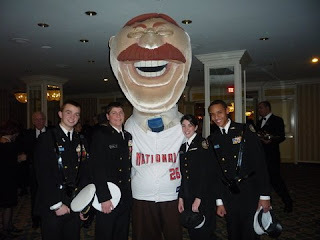 Now, fans do have the opportunity as we always say: ‘See The Future Stars Of The Washington Nationals’." 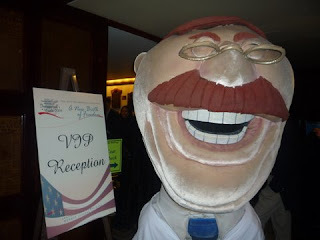 Mr. Silber was standing among a packed house at The Hyatt Fair Lakes in Fairfax, Virginia. Nearly 200 Fans, Boosters and Sponsors of The Potomac Nationals were on hand to celebrate 2008's Carolina League Championship and look forward to another fresh start of young talent coming on board for 2009. Coming right behind Sunday's NatsFest at Nationals Park, January 25th became a Full Baseball Day for The African Queen and I. The 14th Annual Potomac Nationals Hot Stove Banquet and Silent Auction was in full swing. My Favorite Player Of All Time!! Frank Howard was on hand to engage the crowd, be his usual robust and outgoing self and entertain like not many former baseball players out there. And Bobby Williams, Director of Player Development for Our Washington Nationals was there as well. Mr. Williams giving the gathered P-Nats Fans and Boosters a preview of what to expect at Pfitzer Stadium in Woodbridge, Virginia for the 2009 Season. Throughout the night, guests could bid on Silent Auction Items including the opportunities to be "GM For The Day" for the P-Nats, Or--Announcer at a 2009 Potomac Home Game. But Potomac Nationals items where not the only things available in the wide ranging auction. A Signed Hockey Stick from The Washington Capitals was there for the taking, as well a baseball bat signed by Hall Of Famer Tony Gwynn and another Baseball Package signed by Cal Ripken, Jr. All proceeds going to The Boys & Girls Clubs of Greater Washington. "Hondo" spoke privately with The Booster Club before the main event began, then shook hands and signed autographs for anybody wanting. Later Frank Howard gave his usual funny and self-deprecating speech to the gathering. (We haven't had the time to do the transcript, but here is an audio link courtesy of The Potomac Nationals). 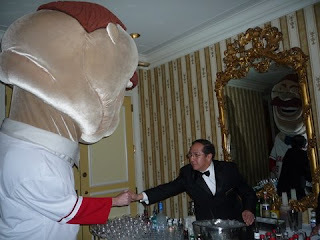 What was clear throughout the evening's event is that the now 5-Year committment to Potomac by Our Washington Nationals is paying off dividends. Mr. Silber seems very pleased: “This relationship is incredibly important. When you have the opportunity to be affiliated with a ball club that is in your backyard and your fans have the opportunity to see players at early stages of their careers and then maybe two or three years later see them playing in the Major League Ball Park and it’s all local—that’s a tremendous advantage. And certainly, the trend for many of the major league teams in recent years has been to try to have as many of their Minor League Affiliates as close as possible." The Potomac Nationals first home game of 2009 is set for April 17th. On that night, attendees will receive a replica Carolina League Championship P-Nats Ring--similar to very ones given to Staff and The Players of The 2008 Carolina League Champions. 2009 Season Tickets are now currently on sale. PSS--Mr. Silber who fills in as First Base Coach for The Potomac Nationals during each season, stated his goal is to become the very last person in Professional Baseball to wear jersey number 42--Jackie Robinson's number. Growing up in Brooklyn, Art was a diehard Dodger and Jackie Fan. Only he and Mariano Rivera of The New York Yankees are the only two persons left in Professional Baseball still allowed to wear the now retired number in the sport. They both wore 42 at the time baseball retired Jackie's Number forever back in 1997. “This is a desperate cause because we have 1800 patients we see on an annual basis with Type One Diabetes," stated Dianne Wicklein, Director of Development for The Children's Hospital Foundation. "As you probably know, diabetes—Type One and Type Two—is an epidemic now, Type Two especially. In the past, you never heard of children having Type Two Diabetes. But now thanks to the sedentary lifestyles, lack of exercise and so forth we are now seeing it in children at a very, very alarming rate. In fact, DC has the highest rate now nationally of children with Type Two Diabetes." Ms. Wicklein was standing in The Atrium of The Children's National Medical Center in NW Washington, DC. Surrounding her were young children of all ages--suffering from diabetes and other illnesses. And Our Washington Nationals were on hand to help out in making their future a better one. Looking to close out this four day tour strong, one of very last stops on The 2009 Winter Caravan may actually be one of the most important ones. Since March of 2007, The Washington Nationals Dream Foundation has committed to assisting in helping to build a Diabetes Care Complex at The Michigan Avenue NW Children's Hospital. Ms. Wicklein: “Absolutely. We would not have been able to start this project without them. We have a wonderful working relationship with them and we are both committed—together—to at least get us to $3.75 Million ASAP!! And then all the way to $5 Million.” Currently, $1.1 Million has been raised in additional funding. Once that $3.75 Million level is attained, ground can be broken on the Complex Care Center." Since The Dream Foundation's investment, over 248 additional donations ranging from $5 to $500,000 have been pledged. “The Children’s Complex is really going well. 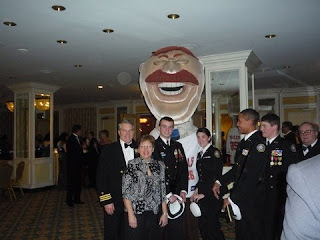 We are happy to with the progress," added Marla Lerner Tanenbaum, Chair of The Washington Nationals Dream Foundation. "But I would like to get over the financial hump this year. I really would like to get there. Granted, it’s a tough time to raise money, but this is such an exciting opportunity for The Dream Foundation to get these doors open—so we keep pushing it." For nearly one hour, Josh Willingham, Scott Olsen, Justin Maxwell, Steven Shell, Terrell Young, Mike O'Connor, Radio Broadcaster Charlie Slowes and TV Broadcaster Bob Carpenter entertained the ill youths. Even My Best Friend Screech!! was on hand to provide some laughter. Of all the Winter Caravan Events witnessed over the past extended weekend, this stop at The Children's National Medical Center had that special feeling of importance. The opportunity to assist one less fortunate today and make their life a better tomorrow. 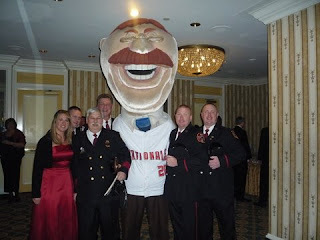 PS--Some of you may recall a special "Text To Give" night at Nationals Park last season. Dianne Wicklein: “Last year on July 13th, we had the First Annual Children’s Nationals Day at Nationals Park. That was very exciting. Our kids were all involved in the Pre-Game. We launched the first in Major League Baseball “Text To Give” where people could text in their donation while at the ballpark enjoying the game. It was a miracle we got that program approved by Major League Baseball but it was so successful we are going to be doing it again this year. 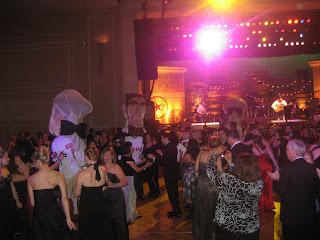 Our second annual event will be on July 5th, 2009”.